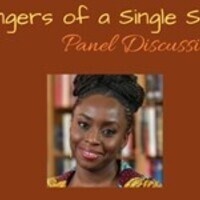 Come and join the African Students Association on a panel discussion on the Ted Talk titled "The Dangers of a Single Story" by Chimamanda Ngozi Adichie, a prominent Nigerian author. Individuals who would like to request accessibility accommodations should contact icasa@ithaca.edu. We ask that requests be made as soon as possible to ensure they can be met.